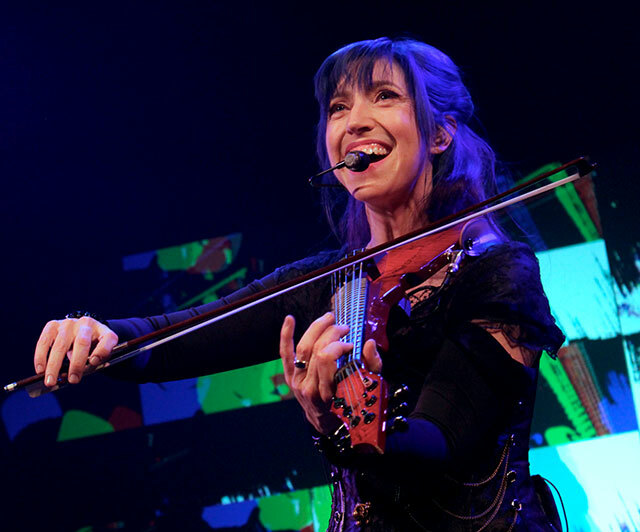 Val Vigoda is the newest Artist Mentor to join the Electrify Your Strings team and we’re thrilled that she’s returning this summer to bring her incredible talents to MWROC. Val is a live-looping, electric violinist, singer/songwriter, and a founding member of the band GrooveLily. She has toured the world with Cyndi Lauper, Joe Jackson and the Trans-Siberian Orchestra and is now touring the solo, multimedia, music concert Just Getting Good. Her latest venture is Ernest Shackleton Loves Me, an off-Broadway show that she co-wrote and stars in. Val studied at Princeton University and has taught at Stanford University, Emerson College, and the Berklee College of Music. She has co-written songs for Disney’s Tinker Bell movies as well as the scores for ten stage stage musicals which have been produced from McCarter Theatre to Off-Broadway. Valerie won the Jonathan Larson Award, the LA Ovation Award for Best Musical, and the ASCAP Richard Rodgers award. Val lives in LA with her 10-year-old son Mose.